304 pages | 9 B/W Illus. Keith Dowding is Professor of Political Science in the School of Politics and International Relations, Research School of Social Sciences at the Australian National University. Patrick Dumont is Researcher at the Institute of Political Science of the University of Luxembourg. All political systems are governed by ruling elites – presidents, prime ministers, ministers, civil servants, judges, mayors and councillors all play important roles in running our lives, while beyond the state people are picked to run international organizations. Social elites, such as global business or media tycoons, religious or ethnic leaders, play a major role influencing public policy. 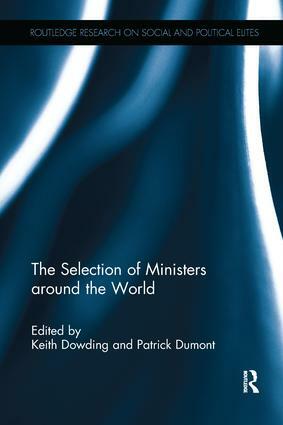 The books in this series examine all such political and social elites within local, national and international arenas. We are interested in theoretical and empirical analyses of elites. Whilst elites have been studied in the past, modern computing and electronic data-collection facilities mean that for the first time comprehensive information on the personal characteristics of elites, including factors such as birthplace, age, and social and educational background, can relatively easily be gathered. We can explore the ways in which people enter the elite, the networks they form and the policies they effect. Modern techniques open up exciting opportunities to examine our governors, their actions and interactions in more detail than ever before.